The human brain has 100 billion nerve cells, all of which are present at birth but have few links between them. Babies’ brains develop by creating an intricate network between these cells. 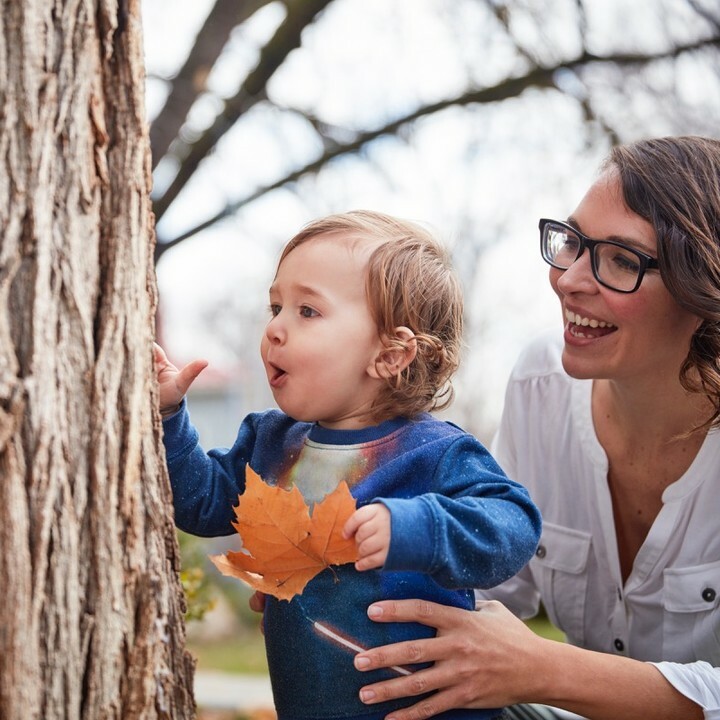 Research shows that there are certain types of experiences you can give your baby to build those lasting connections. And the good news is, they’re all easy to do. A newborn’s nervous system is truly #nofilter: she can’t screen out anything that her eyes see, her ears hear, or her skin feels. Several sound sources at once - even a typical coffee shop atmosphere with music playing, several people talking, traffic noise, etc. - can easily overstimulate and confuse a baby, causing her to shut down. Your newborn prefers the sound of one human voice at a time and calm, rhythmic tones. After 9 months in the dim light of the womb, newborns’ eyes take a few weeks to adjust to more intense light. In dim light and when awake, newborns will open their eyes and look around the room for a few moments. 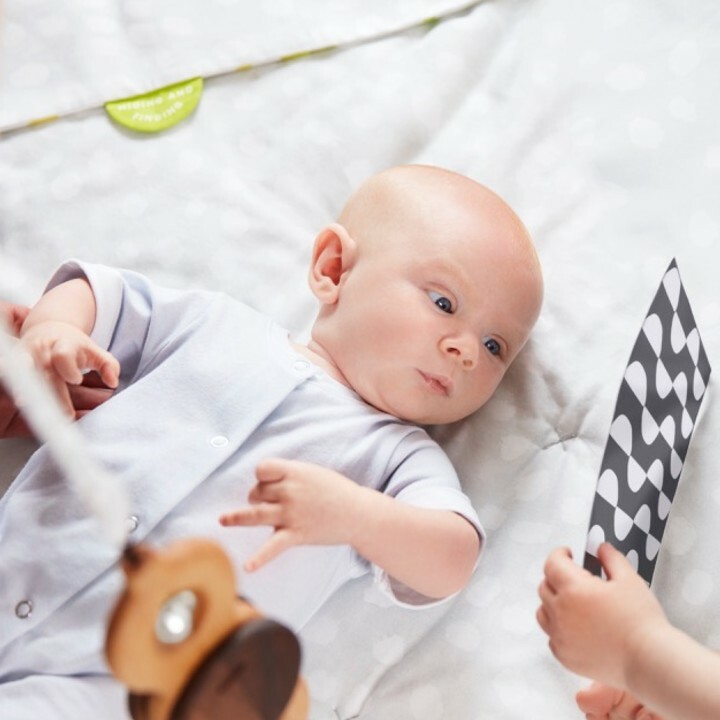 This early looking helps them practice two eyes working together (it is common for a newborn’s eyes to not look in the same direction) and also exercises their pupillary reflex – where the baby’s pupil gets bigger or smaller based on different amounts of light. You can help develop your baby’s brain-eye connection by giving her gradually varying levels of light intensity (avoiding strong lights, such as direct sunlight). You can use a dimmer switch, a low lamp, or curtains when your baby is alert. Skin on skin time can be inconvenient sometimes, but it’s worth it. Skin on skin offers a huge array of benefits to your baby: better digestion, temperature regulation, weight gain, improved immunity, improved sleep, and even brain growth. There are benefits for parents as well: feel-good hormones are released when you and your baby have direct skin contact. Sometimes it is hard when your baby has the rooting reflex and associates skin on skin with feeding. Consider feeding with baby in her diaper, your shirt off, and a blanket over your shoulders for warmth. Before you get undressed, try to remember to get a glass of water, your phone, and anything else you want handy in case your baby falls asleep and you want to relax together. Undress your fed baby down to her diaper and place her on your bare chest. If she’s awake, this is also a great chance for tummy time! Try taking a bath with your baby. Make sure to have towels ready on the floor within reach before you get in, and someone to help you and baby get out of the bath if possible. A space heater in the bathroom can give you a little extra warmth. If your baby enjoys massage, your light touch with coconut oil is great for skin on skin contact. It’s most calming for a baby to massage from the center of their bodies out, so lightly rub down your baby’s chest, legs, and arms. Try a space heater in the bathroom after a bath, and use dark or older towels under and around your baby. Sometimes the massage oil can stain fresh white towels. Skin on skin works great for dads, moms, and even supervised siblings. If you’re feeling down, worried, or anxious - and what new parent isn’t (sometimes!) - skin on skin contact will release oxytocin, a natural antidote. Decades of research show that time spent looking at high contrast images is important for a baby’s cognitive development. Until about the fifth month, babies use their eyes as the primary source for information about how the world works. Once your baby’s pupils are working and her two eyes start to coordinate, she'll be compelled to look at high contrast images. Start with simple images about 12 inches away from your baby’s face (about the distance from your hand to your elbow). Hold the images steady and try not to switch images until your baby looks away, a sign that she’s losing interest. You may notice your baby stares at the images for many seconds, even minutes at a time. When she loses interest in one, change to a new image, and eventually switch to more complex images as her eyes grow stronger. You can help promote visual tracking by slowly moving an image back and forth horizontally in front of her face to help her practice following a moving object with her eyes. This is an important skill later for reading, writing, and hand-eye coordination. Offer high contrast images in the car, during tummy time, and during alert “play” times for the first 14 weeks. After all that time in the womb, it’s important for new babies to stretch out of their womb position and use their muscles in new ways. Offering a variety of positions throughout the day can help your baby avoid flat spots on her head, help her brain start to understand where her body is positioned in space, and build strength. Baby carriers, car seats, baby swings, and strollers are amazing and very necessary at times, but try to give your baby some time on a flat surface every day. Occupational therapists recommend turning your baby’s head from side to side to avoid a flat spot forming and neck muscles from tightening. Here’s a video from Rachel Coley, Pediatric Occupational Therapist with advanced specialized training in infant neurodevelopment. Most babies can’t hold their head pointed forward: it flops to one side or the other. Babies are generally born with a preference for turning their head to one side—in the womb, their head was positioned on one side– so it’s important to help your baby learn to turn both ways. Side lying is also good for your baby — and usually less frustrating than tummy time can be! Side lying helps babies build strength in their back and belly, and also encourages them to bring their hands together—an important developmental step. Roll up a blanket and use it to prop your baby on her side, supporting her back (always with your supervision). You can put black and white cards in a standing card holder in your baby’s line of sight for something to engage her. Eventually, switch her to her other side—and repeat! Babies also enjoy lying on their backs with their heads to the side. Be sure to switch sides occasionally by gently turning her head. The American Academy of Pediatrics recommends supervised tummy time for full-term babies starting in the first week, as soon as baby’s umbilical cord stump falls off. Some babies love it, but (alas!) it’s not a happy time for others. (In a poll of Lovevery Instagram followers, 52% said their baby’s tummy time reaction was 😄 while 48% said it was more like 😩). Either way, you’re not alone. Keep trying even if your baby doesn’t like it – tummy time is essential for building the muscles and coordination needed for rolling over, crawling, walking, reaching, and playing. Slowly roll your baby onto her tummy with arms tucked under her shoulders. Newborns like to have their head to one side while on their belly, mimicking their position in the womb. Prop some black and white cards in a standing card holder. So it’s in view, like Stef and Ayesha Curry’s baby Canon, offer black and white images in the card holder on The Play Gym. Periodically, move your baby so her head rests on the opposite side: head turning helps avoid flat spots and tight neck muscles. of her so she can see the images when lifting up her chin— and eventually her chest. a day. If she seems to be getting tired or starts crying, it’s time for a break. Supervise your baby on a blanket on the counter (hand on baby’s back), and bend down to talk to her and see if she tries to lift her head to look at you. Put your baby on your chest on her tummy facing you, and softly talk to her to try to encourage her to lift her head. Put your baby belly down on your thighs and gently rub her back. Holding your baby upright over your shoulder while gently supporting her head also strengthens her neck and back muscles. It’s awkward to talk to someone who doesn’t talk back yet, but the research is clear—there’s a direct link between a child’s intelligence and the number of words spoken to her. In the first few months, your baby is constantly listening to the intonation, rhythm, and patterns of your voice. Even though she can’t understand what you’re saying yet, her brain is laying the groundwork for acquiring language. Try this reading position (above)—your baby will take more interest in the book you’re reading if she can see your face, too! Plus, it helps to support awkward, slumpy little bodies with your legs. Go on a house tour. When your baby is awake, facing forward if possible in a wrap, or with their head turned to the side in a carrier, walk around your house and talk about what you are seeing and experiencing. “House tours” will be a favorite activity for the first year. Talk aloud to your baby about what you’re doing and what she’s doing — just narrate your day. During diaper time, talk face to face. Make eye contact and respond to her cues. If she starts to coo or vocalize, talk back to her. “Serve and return” communication is a well-studied ingredient for a child’s developing brain. Sing to your baby, even if you don’t think you have a great voice – your baby will love it because it’s you! Babies tune into singing even more than talking. Talk in the slower, higher pitched, sing-song voice that comes naturally to you when speaking to babies. Babies are pre-programmed to tune into higher tones, and learn more from the stretched out vowels in baby talk. Tell your partner, your baby’s grandparents, and other caregivers how important talking is to your baby’s developing brain. Encourage them to find ways to talk to your baby, too — the more words your baby hears, the easier her language acquisition later on. For more ideas on what to talk about, check out the Talking Topics book from The Inspector Play Kit. In week 4, your baby will start to show more interest in a variety of sounds and patterns. Help her build more lasting neural networks by exposing her to sounds from real life, rather than the pre-recorded sounds electronic toys make. Experiment with high pitched, low pitched, slow paced, lively, jagged, soft, and other sounds, trying to introduce just one sound at a time. When your baby is alert and the room is quiet, create these sounds in her field of vision. These everyday noises are routine for you, but they’re brand new (and therefore interesting) to your baby. Try to involve her as much as possible, talking about what you’re doing and what she’s seeing, even though she won’t understand what you’re saying quite yet. Tear or crumple up paper in front of your baby. Pour pasta into a pan, tap a spoon against a bowl, or make other common cooking noises. Turn a door knob, ring a doorbell, and open or close the blinds or windows. Play and dance along to music with your newest (and cutest) dance partner. As with other forms of stimulation, be sensitive to your baby’s reactions. If she’s unhappy, it’s time to take a break. Research has shown that if you put black and white patterned mittens on your baby’s hands, she may begin to notice her hands several weeks earlier than she would otherwise. Hand discovery is an important step on the path to hand control. You can get black and white patterned mittens for her in The Looker Play Kit, or make your own by tying a piece of cloth with a black and white design loosely around her palm. Lay your baby on a plain blanket with no other high contrast visuals in view. See if she starts to notice her hands. If not, you can gently move her hands into her line of sight. If you made it to the end of this list, congrats! You’re already well on your way to helping your newborn baby’s brain development. Every new experience your baby has is building the brain that will last them a lifetime.